I've been fishing all my life and can't think of a better way to enjoy this great land of ours. I have the support of friends, family and my wife Catherine. Born in Tocoma Washington and grew up in Lindenwold NJ. 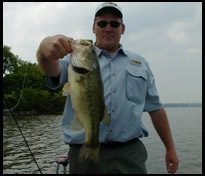 I currently fish the FLW-BFL League Northeast Division, American Bass Anglers Division 9 and the Nationwide Tackle Open Series. Along with fishing tournaments I am the co-director for Washington Township Hooked on Fishing Not on Drugs Fishing Derby for 2009 on Grenloch Lake.